In order to discretize Maxwell's equations with second-order accuracy for homogeneous regions where there are no discontinuous material boundaries, FDTD methods store different field components for different grid locations. This discretization is known as a Yee lattice. The form of the Yee lattice in 3d is shown in the schematic above for a single cubic grid voxel with dimensions . 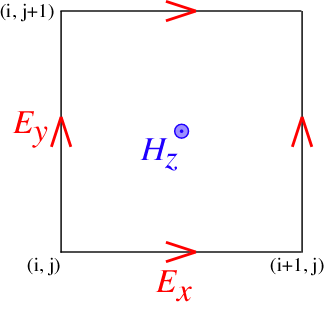 The three components of E are stored on the edges of the cube in the corresponding directions, while the components of H are stored on the cube faces. In two dimensions, the arrangement is similar except that we set . 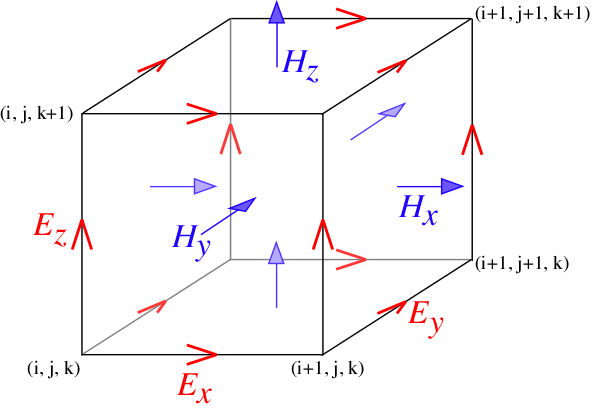 The 2d Yee lattice for the P-polarization (E in the xy plane and H in the z direction) is shown in the figure below. The consequence of the Yee lattice is that, whenever you need to access field components, e.g. to find the energy density or the flux , then the components need to be interpolated to some common point in order to remain second-order accurate. Meep automatically does this interpolation for you wherever necessary — in particular, whenever you compute energy density or flux, or whenever you output a field to a file, it is stored at the centers of each grid voxel: .